Even before Google and every single one of its services got blocked in China mid-2014, the nation’s Android phone owners weren’t fans of the official Google Play store. That prompted a billion-dollar industry in alternative Android app stores. At first it was startups which disrupted Google Play, but eventually China’s tech titans weighed in, and they now dominate Android app distribution just as they control so much else in the country’s online life. 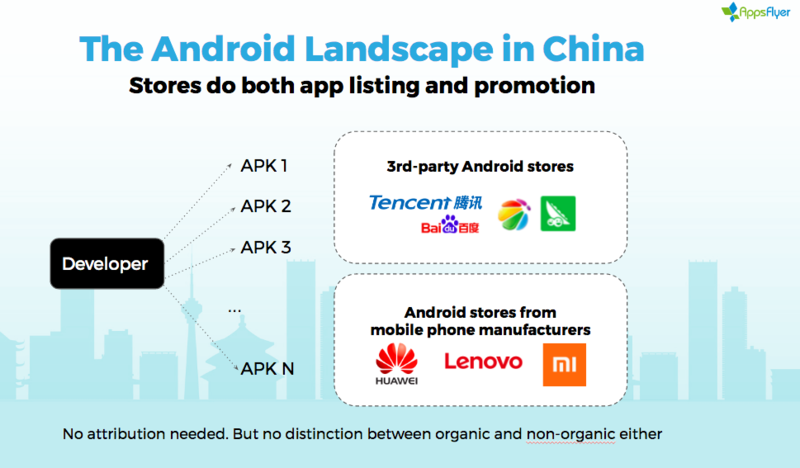 The Chinese Android mobile app market is different from anything you have ever known. There are over 400 app stores and Google is only a small fish in this big pond. Both are necessary for accurate attribution. Google Play service is blocked in China, so IMEI is the most popular android Device ID for ad tracking. If you want to promote Android Apps in the China market, you must send the IMEI and Android ID to AppsFlyer's SDK according to the introduction in the AppsFlyer SDK Integration - Android. Since there are multiple Android App Stores in China market, AppsFlyer provides three main solutions to track Android installs described below. Chinese Android device users download apps from different Chinese Android App Stores instead of Google Play and most of these App Stores provide ad units for App Advertisers. Among these App Stores the main ones are Tencent MyApp, 360 App Store, Baidu App Store, Xiaomi App Store, OPPO App Store and Huawei App Store etc. For example, if you want to promote your Android App via Tencent Social Ads, Tencent Tui Ads and Wechat Ads, you must upload the Android App to MyApp(aka Tencent Android App Store), which brings you organic installs at same time. Baidu series ad networks, 360 Ads, Xiaomi Ads, OPPO Ads all operate in a similar way. Meanwhile, many Android installs are generated from APK download links in mobile web pages or in-app ad space. AppsFlyer provides three main solutions to track Android App installs in China market, you should use the method most relevant to your needs. Description: The well-known Chinese Internet companies or mobile device manufacturers have created their own Android App Stores and Ad Platforms/Ad Networks, taking the advantage of their huge traffic resources in China's domestic market. However, these big companies strictly control traffic to see if the user who clicked on their ad downloads the App from App Store of a different company. In such situations, you have to generate a unique out-of-Store App for each Android App Store. Meanwhile, you can use the AppsFlyer Tracking Link to track the performance of the ad campaigns built on those companies’ own Ad platforms/Ad Networks. By using this method, you can track both organic install and non-organic installs. At the same time, you can optimise ad campaigns in the term of ad units, ad set and creatives etc. For example: If you want to promote your Android App via Tencent Social Ads, Tencent Tui Ads and Wechat Ads, you must upload the Android App to Tencent Android App Store and MyApp etc, which brings you organic installs at the same time. Baidu series ad networks, 360 Ads, Xiaomi Ads, OPPO Ads all work in the same way. Preparation: How to Track Out-Of-Store Apps, click here. Description: To promote Android Apps in Ad Networks that have no mandatory requirement on where to download the App, you can simply provide an APK Download Link or an APK and the AppsFlyer Tracking Link to the media source. It is easy and fast to launch ad campaigns. It is also convenient to check performance of different media sources at the same app overview page. For example: Bytedance Ads(Toutiao), Sina Weibo, iQiyi, etc. Preparation: Set up one Android Out of Store App, and generate different tracking links for different ad networks. How to Track Out-Of-Store Apps, click here. Description: For Android App Stores that do not support ad tracking, you can still use Out-Of-Store Apps to track all the installs coming from this App Store, only all the installs are attributed as organic installs. For example: Lenovo App Store, Huawei App Store. If you are promoting your apps with more than one of the solutions mentioned above and you want to check the data of all your China campaigns at a same dashboard view, you can use Custom Dashboard.